Can be customized for many specific storage and handling tasks. To store cleanroom booties or shoes the following standard components may be combined to create a storage rack as shown. Can be customized for many specific storage and handling tasks. 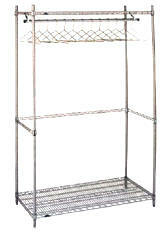 Metro Super Erecta shelving can be customized for many specific storage and handling tasks.